It is so sad when someone so young dies suddenly. The Cut is reporting that stylist Annabel Tollman died suddenly in her sleep from a blood clot. She was only 36 years old. She was a stylist to America Ferrera, Shakira, the Olsen twins, and Scarlett Johansson, just to name a few. She earned a fashion journalism degree from Central St. Martins in London, and was in process of developing a reality show for Bravo at the time of her death. I’m sure her show would have been more realistic than the current shows on Bravo featuring stylists. My prayers go out to her family. Lately students have been asking which of my two classes should they take? They can’t decide if they should focus on visuals or styling? I scratch my head with a bemused look and say why not do both!?! 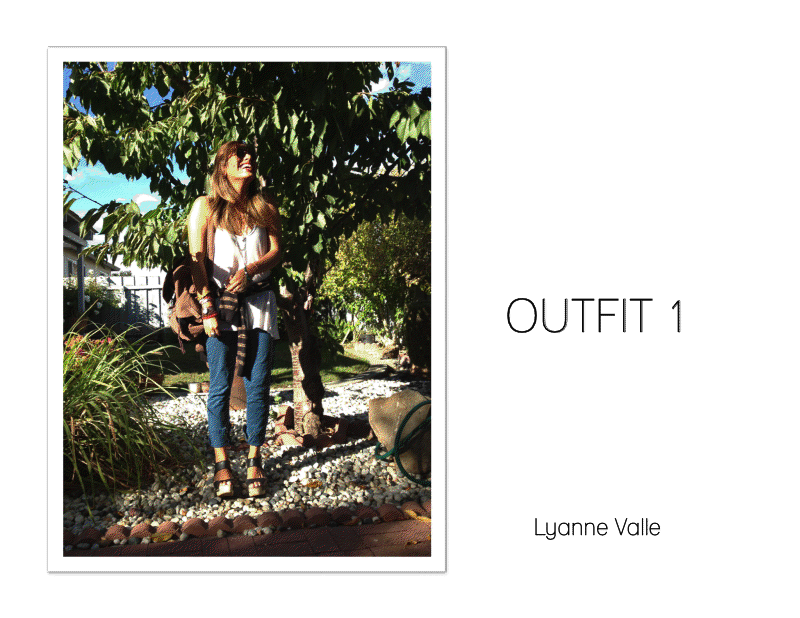 A visual person is a stylist ,and stylists do visuals. I guess most people never really thought about it, but it’s true. It’s how I can teach both subjects – the skill set is interchangeable. If you can dress a mannequin, you can dress a model. If you can prop a window, you can prop a set. Both employ the principles of design, take loads of creativity, and are hard work. Sure there are some differences to working in a store, as opposed to a photo shoot, but we are all cut from the same cloth. I’ve had a few arguments with myself trying to decide which is harder, visuals or styling? Sometimes visuals win the argument, and sometimes styling. When doing a store, it’s very physically demanding, but there’s fewer people I have to deal with, as I change out mannequins, set-up interior displays, or do floor sets. I oftentimes, just follow my store directives and do my thing! When styling there’s a lot of people on set, but the atmosphere is very fun, jobs are almost always catered, it’s not too physically demanding (unless you are a prop stylist, and working with big items), and you get to play with clothes all day. Which is more fun? Only you can answer that. I don’t really like styling as much as I like building and making things, so visuals win out for me every time! Yet visuals can get boring if you work for a chain retailer, because you don’t get to be as creative as the old days. Now you just follow a store directive and almost everything is sent to you to assemble and install. Freelance projects is when you get to use your own ideas. Styling still requires your creative skills, as the client is looking to you to bring their idea to life – so this can be really fun! You will find that lots of visual folk, freelance as stylists, or are repped by an agent for styling work, and some stylists also do the occasional window. You should too! 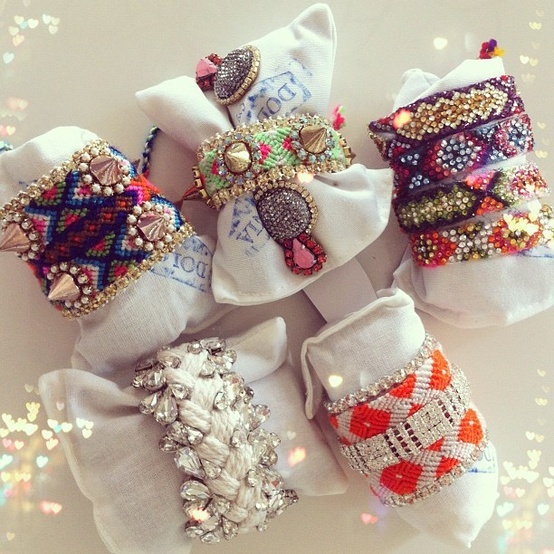 Is this a display of bracelets in a jewelry case at a store, or was this image ripped from a magazine? 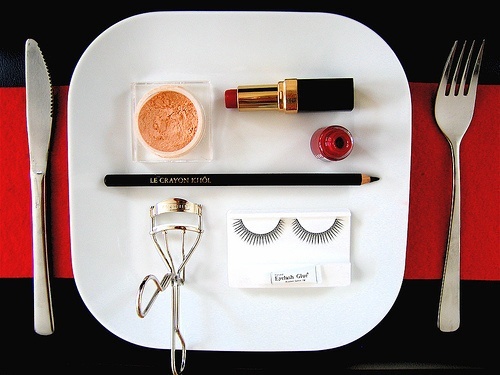 Is this a makeup display in a cube at a store ,or was this image ripped from a magazine? For both images above does it matter? They could have easily been created by either a visual display person or a fashion stylist! Today I will be in introducing your first class project called “The clothes off your back”. Whatever you wear to class today will be photographed and documented. 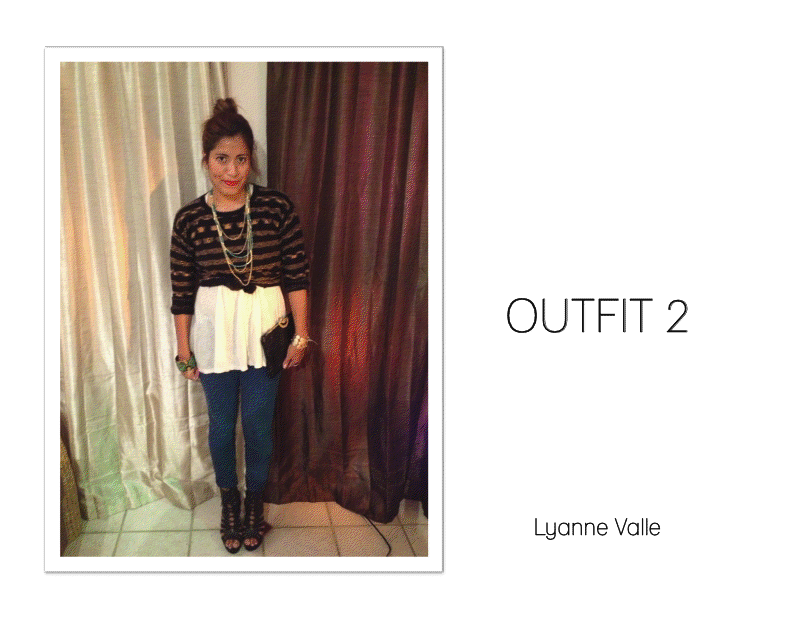 Your assignment is to re-style these clothes into two different looks. You will pair up in teams (2 or 3 people, no more than this). You can ONLY use the clothes you are wearing today. You are allowed to switch out the accessories or change items of clothing with your partner, but you can not change the tops or bottoms of the outfit you are wearing TODAY! Last semester I warned the class when this assignment was approaching, so most people “dressed up” for that day of class. This time I’m springing it on you! These two ladies did a good job! This is one of my favorites. Nancy did a great job and really thought outside the box! get you comfortable working with clothing, especially for my students who are new to fashion. get you use to styling others, which is why you work with a partner, as s stylist you will be styling other folk, not yourself. get you to start thinking of tops and bottoms in a non traditional way. I love how Nancy took her coat and wrapped it as a skirt in the second photo, and used her sweater as “pants” in the first photo! Most importantly have fun with this exercise! I hope you all had a wonderful Christmas (if you celebrate that holiday) and here’s to a fantastic new year! It’s been an amazing year for me and I can’t express how grateful I am to all of you, especially my students. I have never cried in front of a class but this past semester my fashion styling students brought me to tears. Your kind words were too much for my little heart to bear ♥! This class was such a hit, the department chair has asked me to teach it again in the spring (it is usually only offered once a year), and it is already filling up fast. I’m allowed to take 59 students and last time I checked I was already at 52 (FASH 54A – Beginning Fashion Styling). 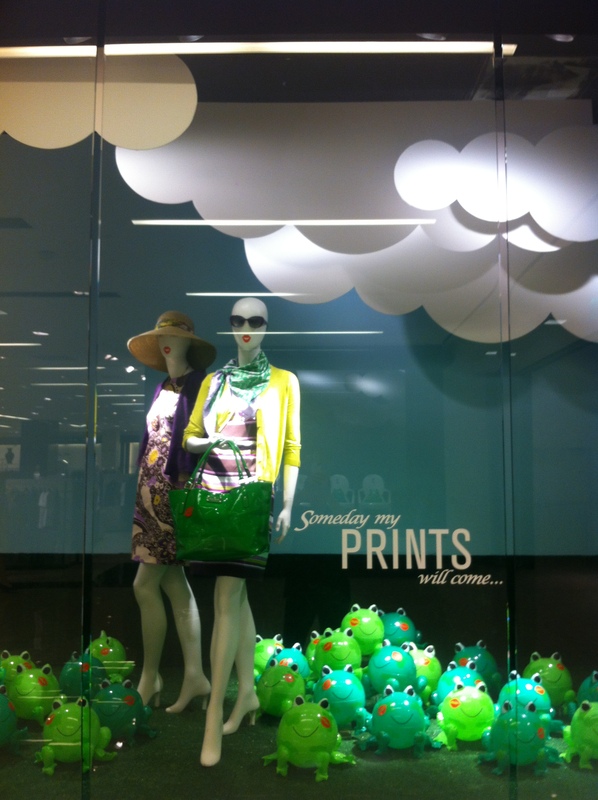 I will also be teaching visual merchandising again this spring. This class is also filling up fast, with a class cap at 59, my current enrollment is 47 (FASH 49 – Visual Merchandising). If you are new to this blog, these classes are offered in the Fashion Department at City College of San Francisco, as part of the Fashion Merchandising degree of Fashion Styling certificate. I know I don’t post as often as I should around here, work does take a huge amount of my time…I do post on my tumblr daily. It’s called the Fashion Teacher. I’m fairly new to tumblr and had no idea I would become so addicted to it, even more so than my Pinterest. I guess it makes sense, we are after all very visual people and tumblr allows us to express that quite easily. Wishing you the VERY BEST in 2013! 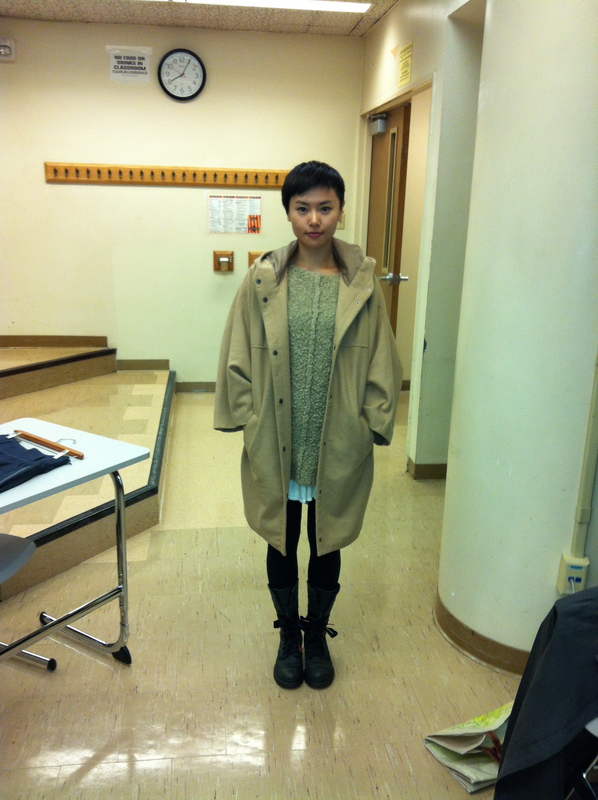 Here’s a final class project from one of my former students in the advanced fashion styling class (FASH 54B). The title of this editorial is called “Fallen Angels”. 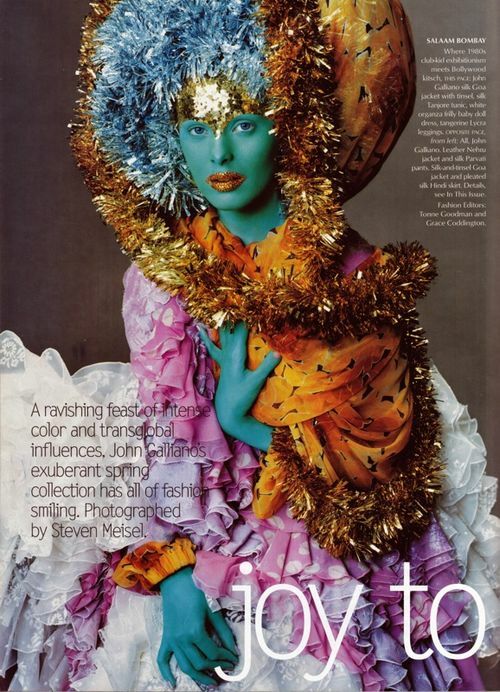 Her concept/mood board is based on the movie SEVEN, thus this editorial features the seven deadly sins. Her target market is Rolling Stone Magazine. She wanted this fashion spread to be dark and edgy. She did all the location scouting, model casting, fashion styling and pre/post production herself. She did hire a team for hair/MUA and photography, and she had friend write poems to go along with each sin. Angela I am so proud of you and I think you did a wonderful job on this! skyline inspired by our Manhattan flagships. For the visual displays that appear inside specialty shop Lane Crawford, our head of creative services, Ruth, was inspired by a toile-style wallpaper she’d first seen inside the historic building at 50 Hudson Street (now the J.Crew Ludlow Shop) in New York’s Tribeca neighborhood. 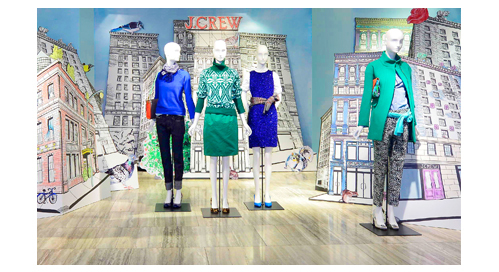 From there, the design team riffed on the idea and decided to create a life-size cityscape inspired by J.Crew flagships throughout Manhattan to serve as a fanciful backdrop for the clothing on display. 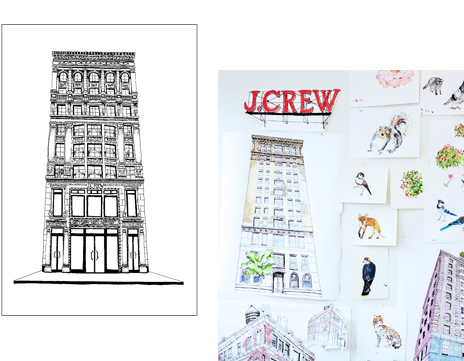 The store design team, which includes Brandon and his assistant, Ellie, created the initial miniature renderings (which remind us of the dioramas we created in grade school) using reference images of the storefronts and architectural blueprints. 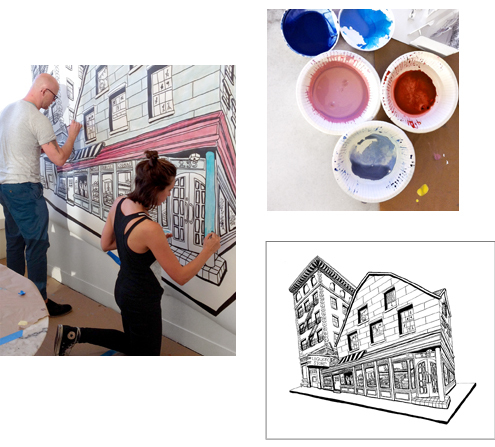 Brandon and Ellie then turned their workspace into an artist’s studio, spending several weeks filling in the illustrations—which were anywhere from 6 to 9½ feet tall—by hand, using watercolor paint. Ruth, Brandon and Ellie traveled to Hong Kong in advance of the opening of J.Crew at Lane Crawford to install the larger-than-life displays, which were shipped over in gigantic crates, to outfit the 2,700-square-foot retail space. The team worked through the night to ensure the display was properly placed to create a playful cityscape effect reminiscent of the Manhattan skyline. When asked to name a fashion stylist they admire a large majority of us say Rachel Zoe, and it’s not necessarily because they admire her only because they have heard of her. She has in fact popularized the profession with her TV show and styling of red carpet celebs, but did you know there are many others out there whose work you’ve seen over and over again and just never really paid attention to who styled that look? 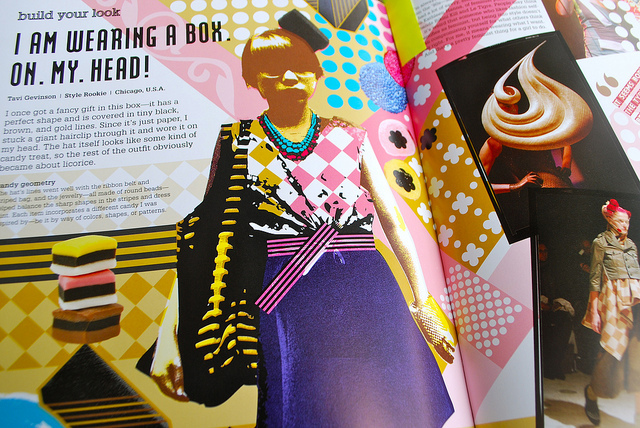 My students were assigned a paper on a fashion stylist they truly admire and why. This was to get them to open their eyes to the fact that Rachel Zoe isn’t the only name in the game, and once you compare her to others you begin to recognize what a one trick pony she is. She has one aesthetic and sticks to hit – constantly! I guess if it aint’ broke don’t fix it, but as a stylist whose job description is to inspire individuals on what they CAN do; sticking to one look can get very boring, very fast. 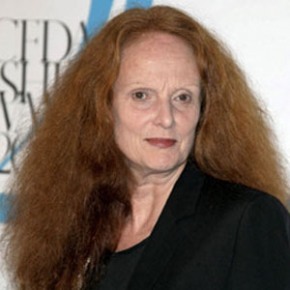 Grace Coddington – no surprise here, she’s amazing! Creative Director for American Vogue. Top Model in the 60s. Became a British Vogue editor in 1969, came to NYC in 1987 to become a Design Director with Calvin Klein, followed by joining American Vogue in 1988, the same day that Anna Wintour, who gave her the job started. 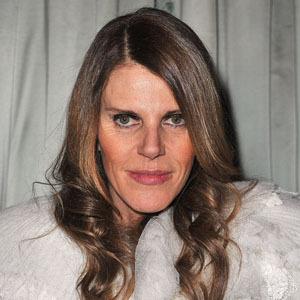 Anna Dello Russo – a fashion maverick! 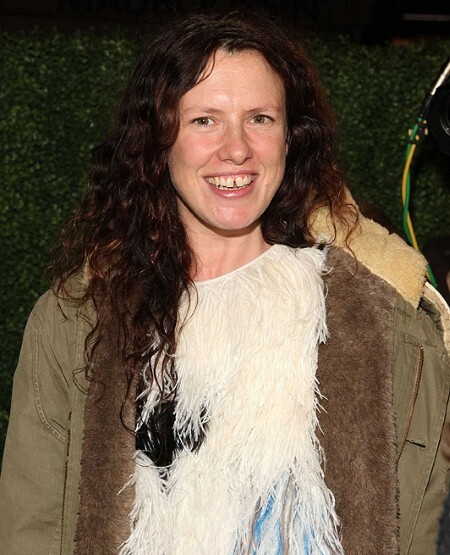 Studied art history in Milan, completed an MA in fashion before becoming an Accessories Editor at Vogue. In 2000 she became EIC of L’Uomo Vogue for six years before venturing off to where she is today, Editor-at-Large of Vogue Nippon, and a fashion consultant. Giovanna Battaglia – my FAVORITE!!!! Former model with Dolce and Gabbana, now an Editor at L’Uomo Vogue, a Contributing Editor at W, and freelance stylist. 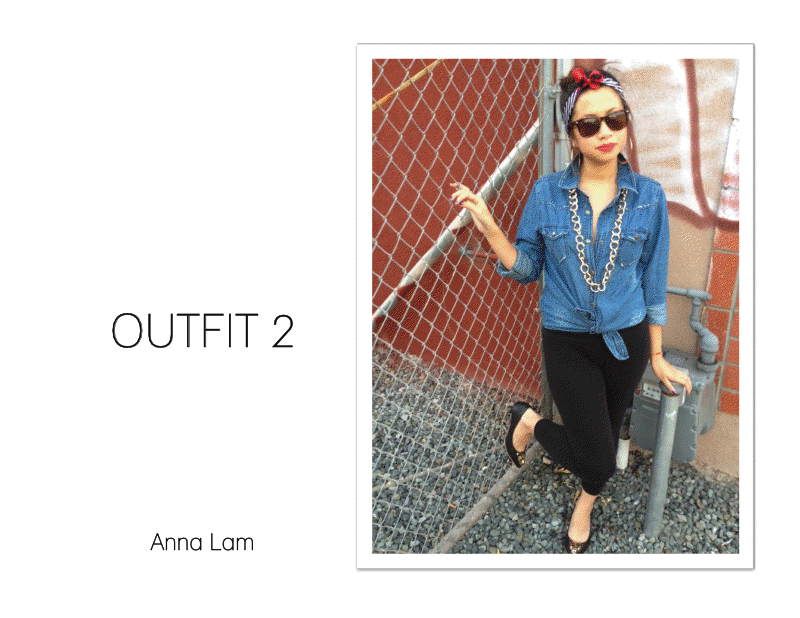 She can do no wrong in my eyes and her personal style is off the charts! 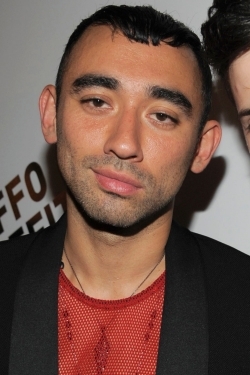 Nicola Formichetti – where would Lady Gaga be without him! 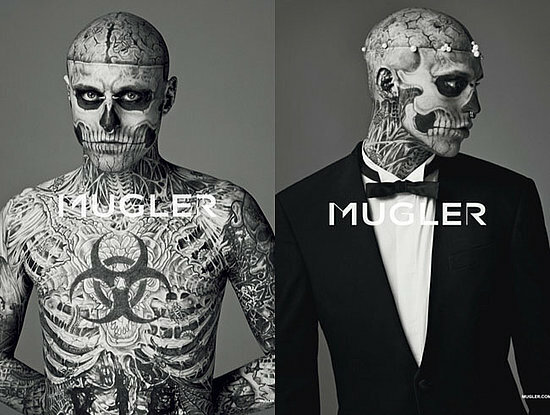 A fashion collaborator for Lady Gaga, the Creative Director for Thierry Mugler, and Contributing Fashion Editor for V Magazine, Dazed & Confused, and Vogue Homme Japan. 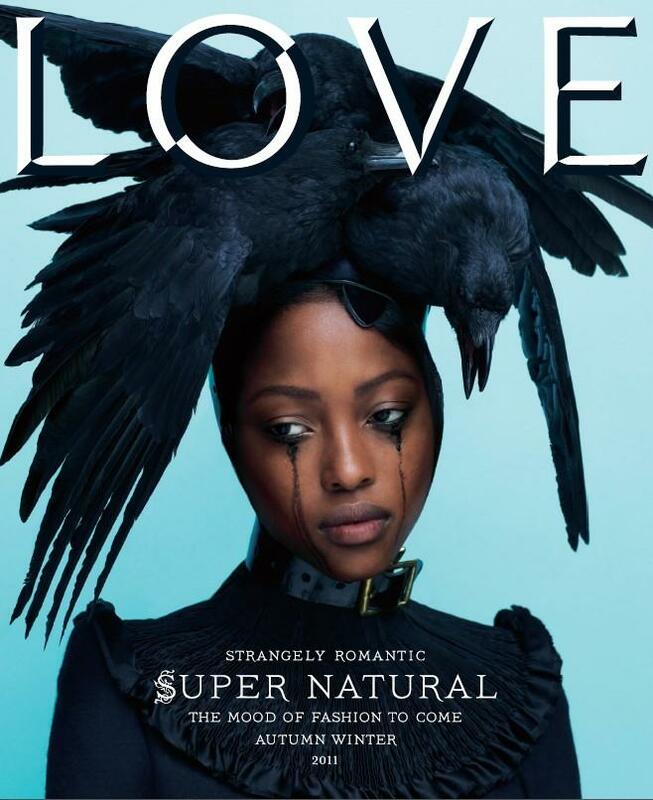 Edward Enninful – brought new life into W’s editorials! Became the youngest ever Fashion Director at 18 with i-D Magazine. 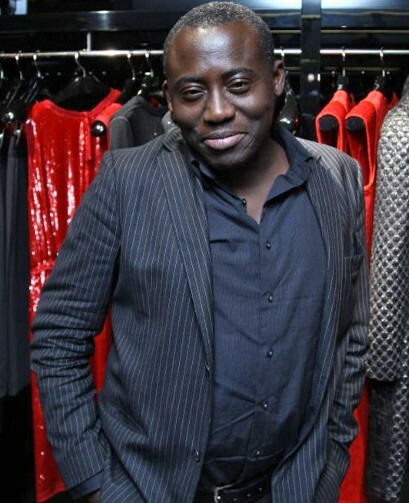 Former Editor to Italian Vogue, spearheaded the “all black” Italian issue. Currently the Fashion and Style Director at W.
Katie Grand – a true stylist in every sense of the word! Studied at Central St. Martins, and began styling for Dazed & Confused in the 90s when the magazine was still new. Became the Fashion Director of The Face magazine and later the Editor-in-Chief of POP magazine. She has styled numerous photo shoots and shows. I’m quite proud of my students and this list they came up with, grant it there were many more stylists listed such as Judy Blame, Melanie Ward, Camille Bidault-Waddington, even Brad Goreski, but these were the top six amongst a class of 60 students. This list is a recognition of those who inspire us in fashion with what we can do and not what we should do. 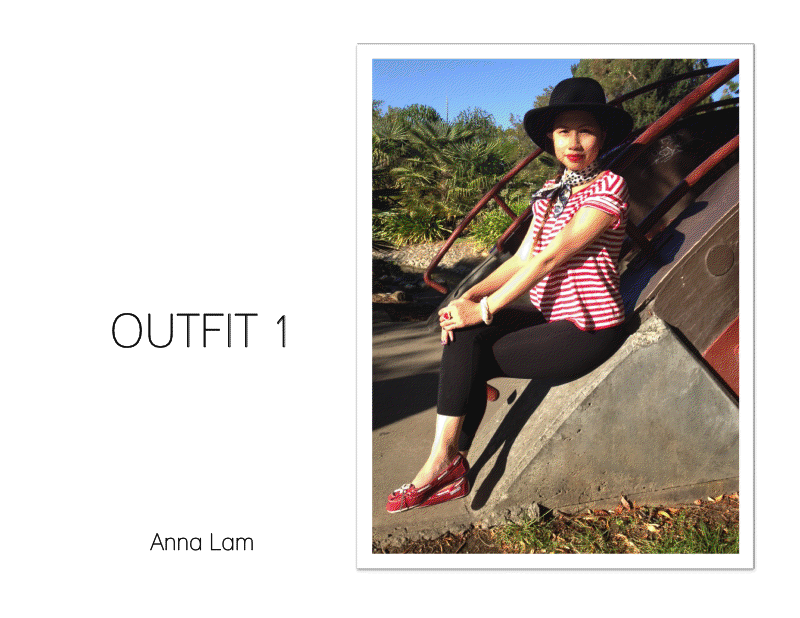 Two weeks ago in class I lectured on fashion research and documenting your ideas with mood boards. The main point of the lecture was getting you to recognize how important it is for you to be able to speak with a fashion vocabulary. Being a stylist comes with a lot of assumptions, the big one being, you know your stuff about fashion!!! Most of us do, as we have been obsessing over fashion magazines since we first learned to read, for me it was getting my dad to get me a subscription to the magazine Young Miss (YM) when I was only nine years old! I can’t stress enough how important it is for you to learn the names and meanings of the parts of a garment. If your boss tells you to pull blouses with portrait necklines or look for shirts with french cuffs, do you know what she’s talking about? If not, you need to learn. Which is why I’m recommending the book Style Yourself. This book is really not that new, it was published over a year ago, and I thought it was a how-to book for teenage girls on dressing. The models and stories are all on fashion bloggers. I didn’t pay this book any attention when it was first released. A few weeks ago it ended up in my mailbox as a gift. I finally sat down this weekend and read it. I use the word “read” loosely, as their isn’t much reading because there are so many pictures. Having lots of pictures isn’t a bad thing, it’s actually a plus for a book like this, especially since we fashion folk are very visual. This book pleasantly surprised me. 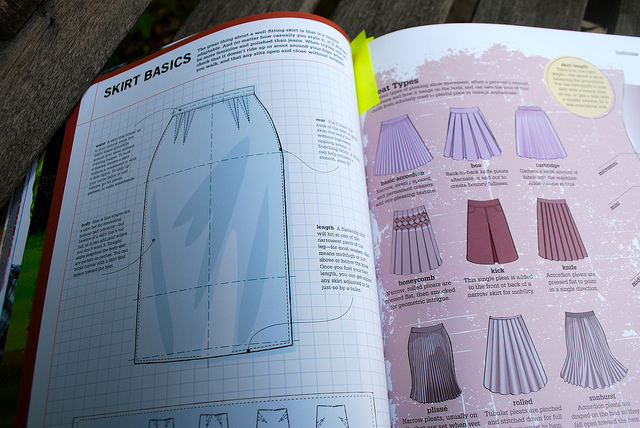 It is, as I first thought, a how-to for the digital generation, BUT the break down of various parts of a garment make this book a great reference for those who don’t have a merchandising or fashion design background. There are loads of pictures showing you the name and illustration of everything from tops to bottoms, to accessories. 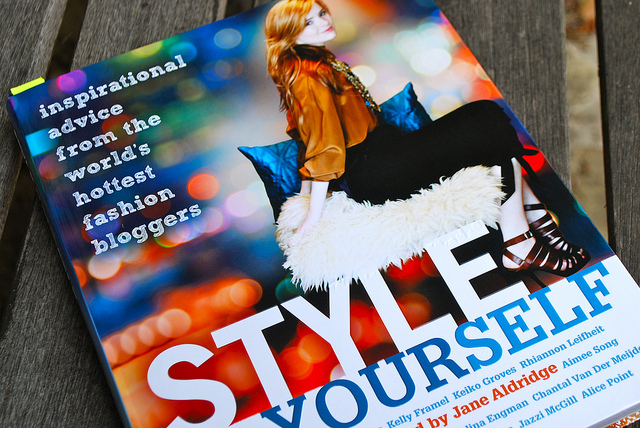 The bloggers in the book provide inspiration for how they style these various items. 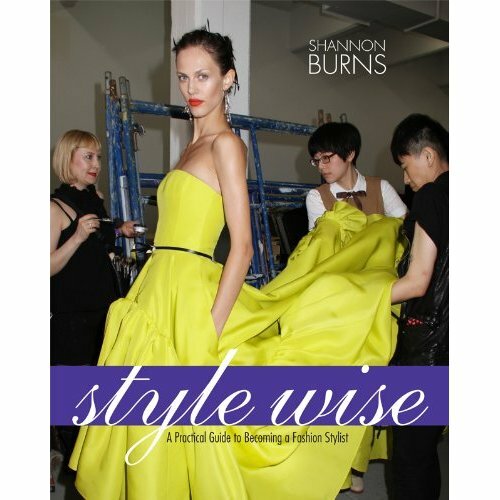 When I finally put this book down I knew I had to recommend it to my students in class who wish to be stylists or work in fashion, but have told me they don’t know much about it. This is a good jump-start, as I’m sure you’ll realize you know more than you think once you start reading it. Former student Chelsea W. is doing amazing work at Bloomingdale’s. I now take a special interest and make it a point to pass the mall windows every time I go to the mall, just because I know the young lady who does them! Thanks for sending this in and please continue to do so! I have some exciting news to share! Part of the reason I’ve been M.I.A. from here is because I’ve been given a new assignment (on top of everything else – not that I’m complaining, I LOVE to work). 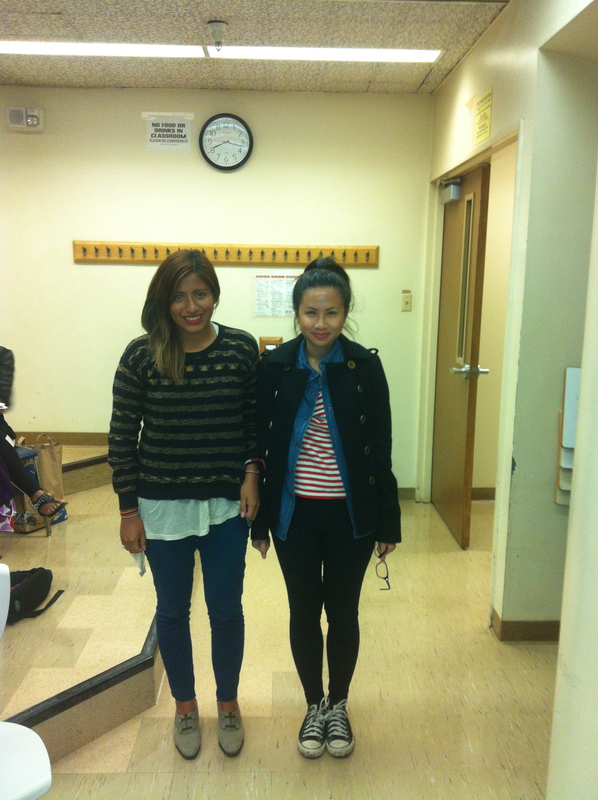 This fall I will be taking over the fashion styling program here at CCSF. I will start with FASH 54A – Beginning Fashion Styling in the fall and then FASH 54B – Advance Fashion Styling in the spring. Yes, I will still be teaching visual merchandising. Styling for editorials or ad campaigns is very similar to dressing a window, and I always say, if you can dress a mannequin you can dress a model! Many of the same skills you use in visuals are transferable to photo styling. You still have to pay attention to lighting, props, and the merchandise. One major difference I see between the two jobs is the amount of people involved. Visuals are done by very small crews, even large department stores might only have five people on staff. Each person in charge of a department or floor. That trimmer does everything, and you grab help as you need it. Photo styling has a small army involved! The photographer, the creative director/editor, make-up artists, hair stylists, the models, the client, not to mention all the assistants, and you the stylist. It’s exciting but hectic. I use to freelance as a stylist whenever my agent could get me work. I found it more challenging than display work, but it paid better and there’s always good food on the set (lol)! I’m currently nose deep in writing curriculum and reviewing textbooks on the subject (who knew there were texts on being a stylist!!) This isn’t going to be a class strictly on how to style a shoot, but on how to be a successful stylist. What are the tools and information you need for your portfolio and stylist kit, what goes into a contract, working with the other professionals, sourcing props, etc. 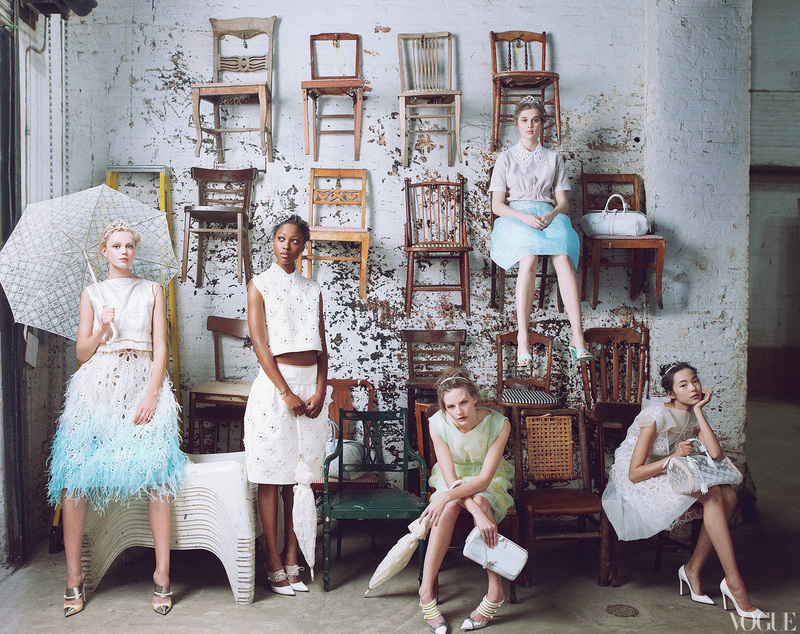 This class is suppose to focus on fashion, but I also hope to touch on set styling (hey that’s visuals 101!) and prop styling. Instead of starting another blog for that class, I’ve decided to post on here. I think both fields can learn from each other, besides visual merchandisers “style” all day every day, in fact some of the books I’ve looked at touch on visual merchandising as an alternative career for this skill set.